Denby Jug - 8⅛" (206 mm) high. 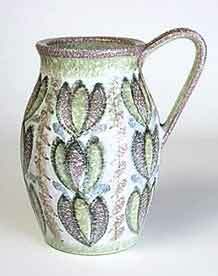 This is from the Glynbourne range and listed as pattern number GB868 (34/5). It is officially 7-1/2" high. I guess Denby measured to the rim and we measured to the highest point -- the top of the handle. It sold for 32 shillings (£1.60) in 1960.